The Longji Rice Terrace Fields or Dragon's Backbone rice terraces were built over 650 years ago during the Ming Dynasty. The terrace fields are found in Longsheng country about a two hours drive from Guilin in China. From a distance, during the growing season, these winding terraces appear as if they were green woven cables laid out over the hillsides, starting at the riverbank and ending near the mountaintop. One can meander through the paddies and villages, greeting and being greeted by horses, pigs, chickens and hard working locals. 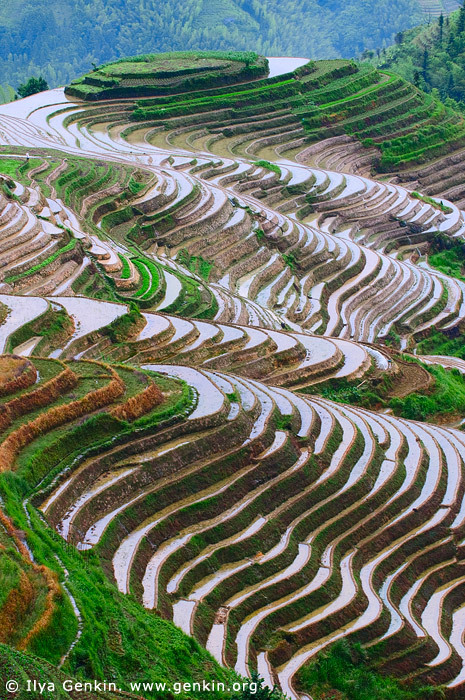 This image id CHINA-LONGSHENG-0002 of Longsheng (Longji) Rice Terraces, is copyrighted © by Ilya Genkin. This is not a public domain image.